Make TOPS Your Career Destination! 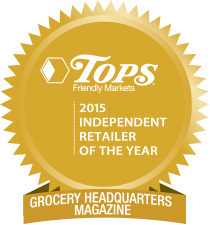 TOPS Friendly Markets is a leading regional supermarket chain based in Williamsville, NY, and operating over 170 stores throughout Western, Central & Eastern New York, Northern Vermont, and Northern Pennsylvania. When you join our family you are well on your way to making TOPS your career destination. Want to know more? 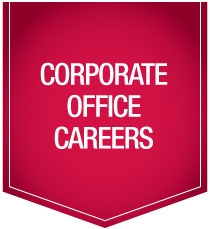 With a multitude of in-store positions and opportunities for growth into a management career or corporate office support position, there are a variety of paths you can take to further your career with us. TOPS offers a variety of opportunities for part and full time employment at our numerous stores throughout New York, Pennsylvania and Vermont. Whether you're interested in becoming a cashier, stock clerk, bakery or deli clerk, meat cutter, or even department manager, there are opportunities at a store near you. Our cashiers are in the unique position of being the final point of contact with our customers, and having the opportunity to leave a lasting impression by providing friendly and courteous service as they accurately and efficiently check out customers' orders. If you enjoy interacting with people, a cashier just may be the right job for you! Shopper Assistants help to provide great customer service and a great shopping experience by clearing our parking lots of carts and ensuring carts are available for our customersÕ use when they enter the store, as well as assisting customers to their cars with their purchases. At Tops, we pride ourselves with bringing our customers a wide variety of the freshest fruits and crispiest vegetables from fields and orchards near and far. We are especially proud to partner with local growers in our market areas to bring the highest quality homegrown produce to our shelves. If you love fruits & vegetables and want to help our customers discover the best we have to offer, apply for a position in our Produce department! Fulfilling customer orders for items such as fruit or vegetable platters, baskets, etc. In our Floral department, we strive to offer our customers a variety of seasonal flowers & plants, as well bouquets, arrangements, and gift baskets perfect for any occasion. If you think you'd enjoy applying your creativity and design skills, apply for the Floral department today! Preparing customer orders for floral arrangements, balloons, plants, etc. At Tops, we feel one of the biggest benefits we offer our customers is fresh meat, cut in-store by real butchers every day! We offer 100% USDA Choice beef, as well as a wide variety of other meat choices. In addition, our Seafood department offers the best selection of fish, shrimp, and shellfish, including Wild Alaska seafood. At Tops, we feel one of the biggest benefits we offer our customers is fresh meat, cut in-store by real butchers every day! We offer 100% USDA Choice beef, as well as a wide variety of other meat choices. If you are skilled in meat cutting (must be a certified cutter or apprentice) apply today! If you're interested in bringing our customers the fresh-baked goodness of breads, rolls, cookies, muffins, and donutsÉor preparing the perfect cake or pie for a special occasion, then the bakery is the place for you! If you're interested in bringing our customers the fresh-baked goodness of breads, rolls, cookies, muffins, and donutsÉor preparing the perfect cake or pie for a special occasion, then the bakery is the place for youÉand if you have a flair for creativity and design, a cake decorator may be the perfect role! From Deli meats & cheeses, to signature salads, to specialty cheese and prepared foods, the Deli/Carry-Out-Cafe is to go-to destination for our customers' meal and party planning needs. If you enjoy serving customers one-on-one, the Deli/Carry-Out-Cafe may be where you belong! Our grocery aisles are the heart of each of our stores. We pride ourselves with providing our customers the best mix of national brands and private label brands at great prices. We also like to showcase our weekly specials with creative themed displays and end caps. If this sounds like something you'd enjoy, apply for the grocery department today! Maintain clean and orderly backroom conditions by organizing grocery area, making bales, stacking pallets, etc. Whether it's beauty & personal care products, health and nutritional items, household items, or the latest in seasonal products, the GM/HBC department is the destination for all of these needs. If you have an interest in helping to provide our customers with a "one-stop-shopping" experience, apply today for GM/HBC. Clear and accurate pricing is a key part of providing a great customer service and a great shopping experience for our customers. If you have a keen attention to accuracy and enjoy the detailed nature of working with signs and tags, a scan position may be just the right one for you! As part of our mission to save our customers time and money, many of our locations provide full-service pharmacies to meet our customers' prescription and health-related needs. If you have a passion for helping to provide these health-related services, a pharmacy technician may be the perfect position for you. It's also a great starting point if you are considering pursuing a degree as a registered Pharmacist! 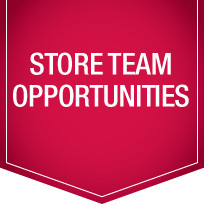 Department or Operations Management opportunities and store specific full or part time openings. NOW HIRING! Immediate openings for Warehouse Selectors starting at $15.20/hr! Apply Below. 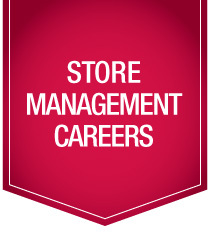 If you love working with people, thrive in a fast-paced environment and the idea of being responsible for the profitability of your own piece of our business excites you, then a store management position may be the perfect fit! *Your previous experience may be taken into account when determining where in the program you'll begin. **Not every store will have the full management team above. 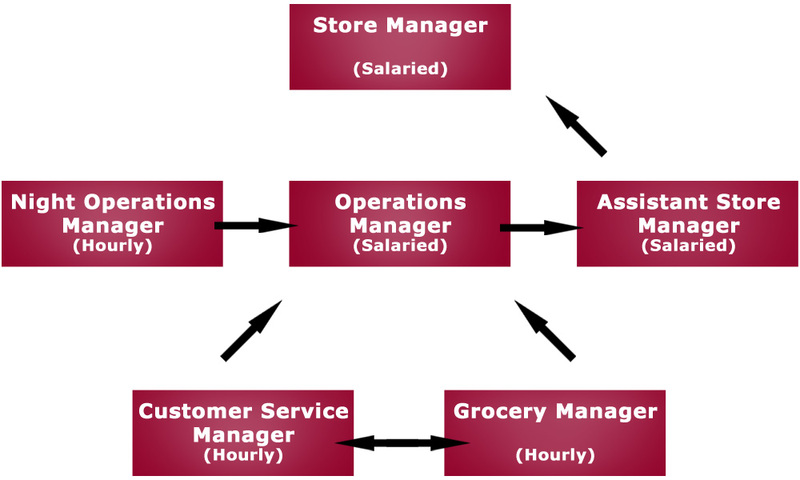 Management structure is based on store size and sales volume. Our stores are the lifeblood of our business and our store associates and management play a critical role in our business. But beyond the aisles and shelves where our customers shop each day, there are a variety of functions happening behind the scenes to help keep them running smoothly. From Accounting and Finance, to Category Management, Pricing and Information Technology, a variety of support departments exist at our corporate offices to ensure that our stores are always open and ready for business. At TOPS Pharmacy we know that our industry is changing. Pharmacy is no longer a volume driven business, it's now a service based business. At TOPS our goal is to help people stay healthy. We are passionate about assisting patients in making good choices about their health and ensuring that they are taking their medications correctly. It's not just about filling prescriptions anymore! Are you passionate about patient centered care? You've come to the right place! Beyond prescription filling, we also provide our patients with services such as administering vaccinations and medication therapy management. We encourage our patients to participate in adherence programs such as our Ready Refill or Medsync programs. Our $3.99 prescription discount program shows that we are true to the company vision of being "Your Friendly Neighborhood Store That Has What You Want, While Saving You Time and Money." 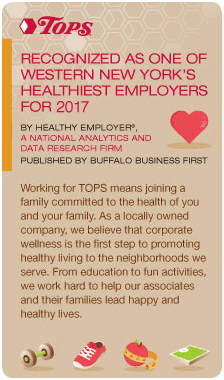 TOPS Pharmacy has over 50 locations across New York State and Western PA, with our headquarters in Williamsville, NY. 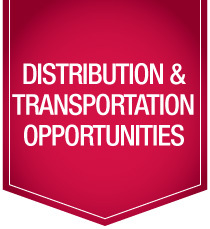 Our compensation and benefits packages are among the best in the industry. Working as a pharmacist at TOPS is not just a job, but a career. 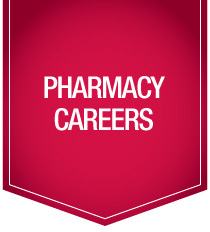 Just ask some of our pharmacists about their careers with TOPS Pharmacy! TOPS Friendly Markets offers students the opportunity to enhance their education by getting on-the-job experience in one of our Corporate Office departments through our student internship program. Internships may be available in areas such as merchandising, marketing, finance and accounting, human resources, information technology or community relations. 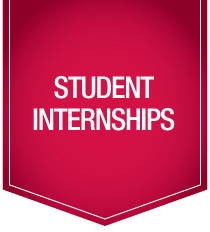 Internships are unpaid and completed for college course credit. If you are interested in pursuing an internship with Tops, please submit a cover letter and resume to jmaciejewski@topsmarkets.com.